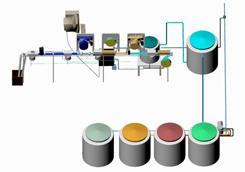 The series of articles program consists of modern industrial systems automated or semi-automated development and adapted to the quick change of products inside the same production line, including FMS– Flexible Manufacturing Systems, or industrial cell systems and Rapid Products Development, rapid prototyping and rapid tooling. Inside these concepts new several raw materials, processes, design and technologies are proposed in our international partnerships with researchers, Institutions and development centers, engineering and industrial design companies , industrial systems design and raw materials manufacturers. A great range of products is accessible in partnerships and available for immediate production, may possibly include molds tools and complete systems ready for production. Information links are provided about all proposed themes. Other tendencies can be mentioned, but that are composed mainly inside trends of ramifications as Petroleum, Chemistry, Mechanics of Precision. (d) a modern maintenance support structure that can bring the system quickly back to normal after equipment failure. FMS is designed mainly for the existence of multiple production lines inside the same facility, or even for the fast change of production lines. FMS for its properties adapts mainly for the industrial suppliers working for third-parties, and they are especially endowed with versatile systems capable to comprehend an extensive production range inside a domain, as assembling, plastics production, chemical, agro-industry, machining and mechanical assembling, involving even finishing and packaging. The images represent the schematic FMS Hydrogel plant in a project funded by International Atomic Energy Agency (IAEA) and IPEN Nuclear Energy Research Institute. Fig.1 (top) represents the basic process with magazine for molds tools swap on the blistering machine, with automated conversion of ingredients addition. Fig. 2 (center) represents the FMS plant including a system where packaging recipients inside the mold cavities (interchangeable magazine) serves as mold shape for Hydrogel. The packaging systems is integrated to the process. Fig. 3 is a schematic FMS plant including packaging systems and irradiation unity. Industrial corporations without own industrial facilities have been effectively the most important trend of the last fifteen years, beginning with the large multinational corporation and reaching nowadays every levels of correlated industry mainly within the international market. The evolution of the subcontracting systems all over the world and the vertiginous increasing of the efficiency progress of the services and production suppliers, quality and time optimization, transformed the industrial perspective. Pressing the traditional models with the new economical models, and causing a spectacular reduction in the periods, the system of industrial subcontracting reached unexpected domains. The reduction of the industrial corporate administration team, also forces to an optimization of the functions and amplification of the skills and responsibilities. The decision-making is more reliable, but it holds more centralized consequences and responsibilities. The nature and character of the current international environment which staff works in new industrial corporation is now more complex than ever, and the skills that are needed extend beyond Information and Communication Technologies to embrace the analytical and evaluative skills essential to effective information management. In the new staff roles is important to define and map staff development needs and thrust in terms of their information skills, creating a model for staff to use in developing their information resources.Continue collaboration with key staff development and information agencies/organization, including the development of a ‘roadmap’ to their various roles and initiatives, providing guidelines and advice for the company on developing their staff’ information skills and the expected benefits for the organization and the productive system development.Some of these information's are available at Internet as marketing reports and analysis for each domain and locality, since US$50. Workings in an electronic environment increases dependency on information; identify, assess, retrieve, evaluate, adapt, organize and communicate information within an recurring context of evaluation and deliberation.It is of highest importance that all staff employed in the industrial corporation sector is given support to develop confidence and competence in their ability to identify and apply quality information, to inform and add value to their working proceedings.It is evident that staff needs more than just particular skills to feel confident working with the wide range of information sources available today; consider the cumulative impact of recent industrial tasks development, the incremental shift from informative to structuring productive chains. The most important benefits from a motivated staff are improving information flow, use of existing resources, return on investment, research capability, and enhance market profile and reputation. The schematic model distributes the basic components of the industrial structure of subcontracting, considering as successfully efficient a basic structure from a staff of three qualified managers to ten/twelve for the administration of 20/25 products in the international market. Starting from the establishment of a reliable Intranet/Internet portal, the actions of the team lead using this tool to interact among information agencies/institutions (marketing, consultants, analysts), services (Design, engineering, prototyping, molds and tools), producers (industrial suppliers) and distribution. Effectively the development stage doesn't settle down on a sequential way, but intercalated, compelling to multiple tasks during the development period. The model establishes above all horizontal structures than vertical, or meaning all the team members shall interact in the decisive process; in reality the model demonstrates in the outline, it even imposes the interaction among the several suppliers (services, goods and consultants). The principal net benefits of this structure it is the elimination of the periodic flotation (seasonality), maintaining an increasing evolution of the profitability, and suspending acquisitions when the market is reduced without implicating in maintaining a structure of workforce, facilities, machines and equipments. Other benefits may be Improved use of existing resources, return on investment, and research capability. The complete presentation of tasks, functional organization and optimization may be seen in RPD–Rapid Product Development. Advanced IT – Information Technology Systems have to be provided for a reliable International industrial company without own industrial facilities. An optimized team enclosing the four main responsibilities supports the organization: Company header, Product Management, Financial Management, and Marketing Management. Within each division in the Intranet/Internet WEB Portal the KM – Knowledge Management system, arrange and dispose to all team the main information related to each initiative, state, situation, and involved decisions or tasks. The external services, suppliers and consultant interact with the manager's team by means of Internet/Intranet WEB portal and other communications interfaces (fax, telephone, etc). Every data from budgets, invoices, data, costs, orders, are integrated to Intranet Portal in real time, and by means of administration interfaces, integrating all available data, files, pictures, and documents. The integrated system updates directly all data from statistics, cash flow, storage flow, orders, requests, and information. The databases are integrated to the Knowledge Management system supplying updated information on real-time.